Are you thinking to start podcasting? Marketers are digging into this industry like mushrooms growing after a downpour. Podcasting is said to be the latest (social) media that hit the shelf. And if you think podcasting is that easy, think again. We have podcasters who make it to the limelight (and make thousands of dollars a month) as well as those podcasters who failed miserably … so badly that they actually resulted in losses instead of profits. So, what really went wrong? 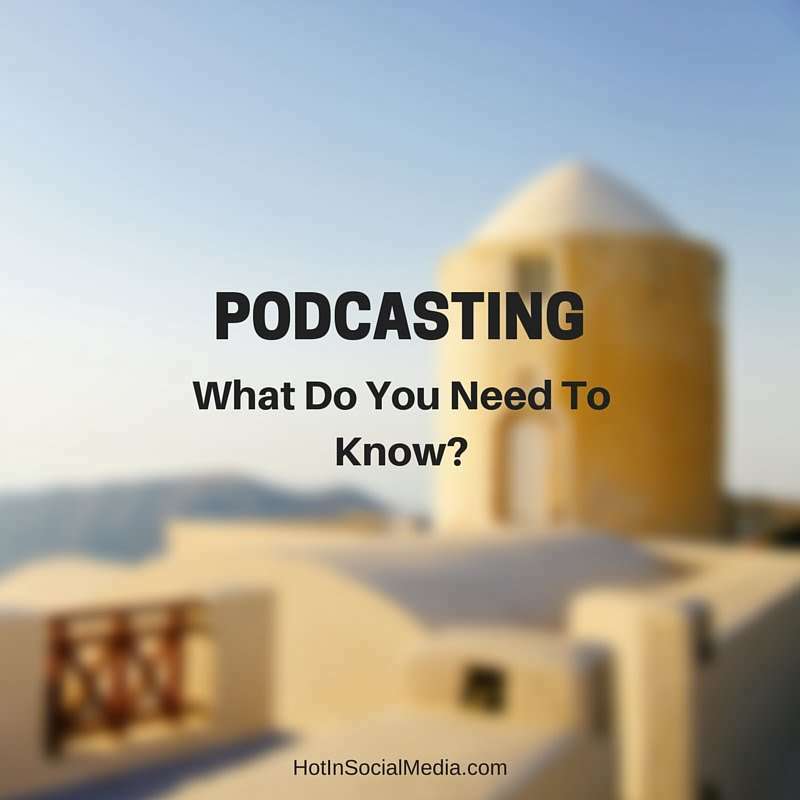 More importantly, what should you know about podcasting? Now that we have set the bar pretty high, let’s dive into the entire article, shall we? Back to the basics: What is a podcast? Podcast is a digital audio file made available on the Internet for downloading to a computer or portable media player, typically available as a series, new installments of which can be received by subscribers automatically. Podcast became a form of media in content distribution back roughly 5 years ago. Well, for starters, John lee Dumas from EOFire (Entrepreneur On Fire) started his podcast around 3 to 4 years back. Apart from all the popularity podcast can get, it had become one of the most popular forms of media in recent years. To be exact, podcast gained momentum roughly early last year. And then since, podcasting had to blast off from the face of the world. Everyone … literally … was engaging in podcasting. Big brands and small brands alike are engaging into the world of podcasting faster than anything else. Of course, it was about time as well as we understand that the normal blog posts and articles don’t make the cut anymore. Make no mistake, podcasting may not be everyone’s favorite but there is still a huge growth (and opportunity) in podcasting. Based on several statistics, there is (an estimated) 46 million Americans over the age of 12 now listen to podcasts on a monthly basis. Ladies and gentlemen, 46 million is a huge number. The podcast is mobile; you can literally listen to podcast regardless where you are or what you are doing. Even though it is highly advisable to be careful when you are listening to podcast while doing other things … you get the point! The podcast allows you to reach out to target markets and the audience you may have missed. To say the very least, it is a great way to grow your brand awareness using podcast. Just like a zillion of industries in this world, podcasting has its pwn negative features as well. For starters, it is NOT easy to pull it through. Don’t believe? Take a look at the numbers of podcasters who start a podcast on a daily basis and closing down the podcast within 3 months. Yes, it is not an easy task and in most cases, it is easier said than done. When it comes to advertising and revenue-generating, podcasting is a twin-edge blade. For starters, there is literally zero links that you can use as call-to-action (at least, the links which are visible). This is because the podcast is entirely audio based! Sure, you may add links in the description boxes and even say it out loud, but at the end of the day, these links are only good if your readers are checking in the description box and clicking on them. Make sense? Podcasting is also very time-consuming. For starters, you kick start the process by recording the audio. After recording, you are required to clean and fine-tune the entire audio file. Lastly, you need some artworks and maybe introduction (cut and match) to ensure that the entire production is a success. Now, the entire process takes anywhere from an hour (if you are used to it or professional) to hours if you are a complete newbie. Don’t forget, the equipment and tools needed to produce a podcast is also expensive! Sure, you may get lower ends one but it would result is lower quality audio. After all, you get what you pay for right? How to kickstart podcasting (as a form of media) the right way? Are you answering the questions they needed most? Are you providing solutions to their problems? After you have answered both the questions above (and you are still determined to start a podcast), the next step is to create an artwork. It doesn’t matter what artwork you have in mind, it has to be at least 1400 x 1400. This is the optimum size for artworks to be visible on iTunes. Additional tip: When you first publish a podcast on iTunes, you will automatically enjoy 30 days to fame. This means that you have a good chance to be featured in the ‘New & Worthy’ column. If you are able to gain sufficient followers and listeners during the 30 days period, you will be rank up as high as the top 10 in the selected section. So, if you are planning to leverage this feature, make sure that you are constantly cross promoting the podcast (using Facebook Ads is a great way) for the first 30 days. This will ensure that you will get sufficient visibility and growth at the same time. Starting a podcast isn’t entirely the easiest work in the world. However, it is still doable and is super effective if you are doing it right. I am curious to hear what you have in mind. Tell me what you think by leaving a comment below. If you find this useful, I would appreciate if you will share this with the world!